180 pages | 4 B/W Illus. 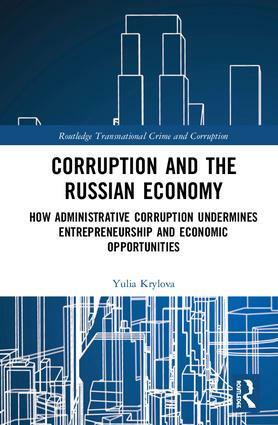 Corruption and the Russian Economy examines why the number of entrepreneurs is declining so rapidly in contemporary Russia, how many economic opportunities are being irrevocably lost each year because of administrative corruption, and why entrepreneurship has become one of the most dangerous occupations in the country over the last decade. Based on extensive research, including in-depth interviews with entrepreneurs and case studies, it reveals a corrupt system of government agencies at both the regional and local levels, and the increasing involvement of public officials in unlawful seizures of businesses. One major conclusion is that the vast majority of informal payments by entrepreneurs to regulatory agencies are made not to achieve illegal advantages, but rather to secure the property rights that they are entitled to under the law. Yulia Krylova completed her doctorate at George Mason University, Arlington, VA. She currently works as a consultant for the World Bank Group. She is also a researcher at the Terrorism, Transnational Crime and Corruption Center at George Mason University, Fairfax, VA.